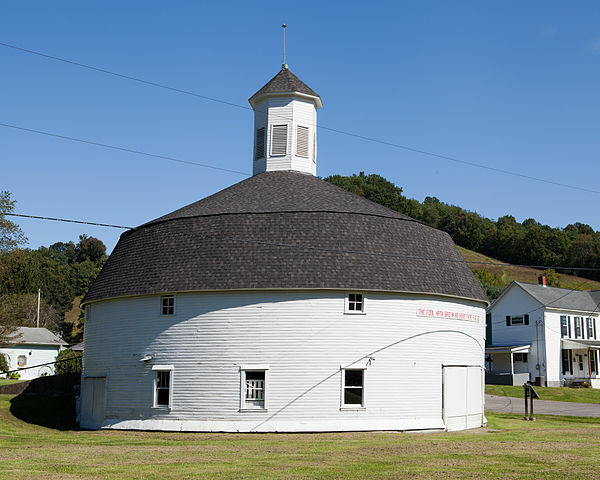 The Hamilton Round Barn in Mannington is preserved by the West Augusta Historical Society. Mannington (population 2,124) was originally known as Forks of Buffalo due to its location on Buffalo Creek. The town site was first settled around 1840, and in 1856 it was renamed Mannington in honor of Charles Manning, a civil engineer with the newly constructed Baltimore and Ohio (B&O) Railroad. The community boomed during the 1890s after oil and gas were discovered nearby, and coal mining became a principal industry in the 1950s. Although many of these industries have since left the area, the wealth that they brought to the community is reflected in its handsome historic homes and public buildings. Many are included in the Mannington Historic District, which is listed in the National Register of Historic Places. Several historic schools are important landmarks. The Wilson School (1919) now houses the West Augusta Historical Society Museum. The Mannington Community Building/Gymnasium (1936) is still used for school athletics, but is also an important community meeting space. A local non-profit currently is partnering with the City to rehabilitate the building, so that it can continue to be a focal point for community events. Two regional heritage tourism initiatives promote visitation to Mannington. The Frontiers to Mountaineers heritage program promotes heritage tourism in north-central West Virginia, including Mannington’s Marion County. The First Campaign Trail, an 18-site driving tour, also draws travelers to the area by interpreting sites associated with the first land campaign of the Civil War. Near Mannington, a small Confederate force burned two B&O Railroad bridges on May 25, 1861, setting in motion the invasion of Virginia by federal troops.